I’d like to blame it all on Martin Edwards. 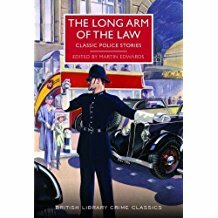 Those anthologies in the British Library Classic Crime series that Martin edits are just too tempting: those delectable covers! And yes, I have been snapping them up as they come out and enjoying them hugely. 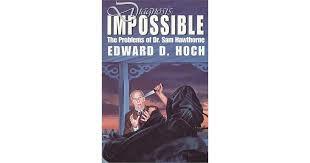 However the truth is that the current short story binge was triggered by finding a copy of Diagnosis Impossible: The Problems of Dr Sam Hawthorne by Edward D Hoch in a second-hand bookshop in Leicester. I do like an impossible crime and the short story is a good vehicle for this kind of puzzle. I enjoyed the stories so much that I downloaded two more collections featuring Dr Sam Hawthorne and then moved on to All But Impossible! An Anthology of Locked Room and Impossible stories edited by Edward D Hoch. At the moment the rest of my reading life is taken up by reading Dante’s Inferno and that may be why I am so much relishing short stories. Every year my book group selects a ‘Big Read,’ a book that is too long or difficult to tackle in a month, but is manageable spread over the summer. In this way we’ve demolished Anna Karenina, Life and Fate, and Middlemarch amongst others. This year it was Dante’s turn and, my goodness, it is a demanding read, though a fascinating one. In the edition I am reading the commentary and the notes are longer than the text. So my bedtime reading at the moment consists of a canto of the Inferno, followed by a short crime story or two, rather like following a meaty main course with a sorbet. And then I fall asleep to Timothy West reading Barchester Towers. Bliss. Feeling low? How about a nice murder? There are many occasions in life – maybe you are in bed with flu, or the dog has died, or the sheer effort of keeping up with everyday life has defeated you – when a good murder is just what’s needed. Of the fictional variety, of course, perhaps the kind of thriller or crime novel that is so gripping that it picks you up by the scruff of the neck and doesn’t put you down until you have read the last page and closed the book with a sigh of satisfaction. But sometimes even that kind of novel is just too much effort, and that’s where the classic cosy comes in. The sheer comfort factor of this kind of novel lies in the fact that nothing too shocking will happen, and that you will be transported not only to another place, but to a simpler time, with no internet, no twitter, no 24 hour new feeds, no Brexit, no Donald Trump. It’s like sinking into a warm bath. It’s no wonder then the British Library Crime Classics, featuring just this kind of novel have been such a runaway success. Informative introductions by Martin Edwards and attractive retro covers based on travel posters add to their appeal. I have a row of them on my shelves. 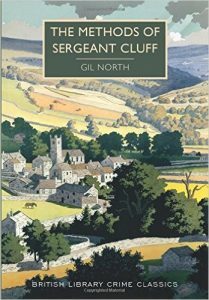 So I was especially pleased to be ask if I would review The Methods of Sergeant Cluff by Gil North, published in September. The Methods of Sergeant Cluff is not quite typical of the British Library Crime Classics, as it wasn’t published until 1961 and is rather darker than the Golden Age novels that are their usual fare. My interest was piqued by a reference in the introduction to Cluff as an English Maigret and this wasn’t far off the mark. Cluff, like Maigret, has an instinctive understanding of human nature, and solves crimes less by logical deduction than by his absorption in the lives of those involved. Like many a fictional detective Cluff is the despair of his more conventional superior, who feels – with some justification – that Cluff’s method is actually to have no method at all. The novel opens when he is called to the body of a young woman, a chemist’s assistant, in the fictional mill town of Gunnarshaw. As with the Maigret novels there’s a strong sense of place. This is a world where the cobbled streets gleam in the rain and sodden sheep huddle in the fields. I was also reminded of those gritty Northern novels of the fifties and sixties, like Room at the Top, in which the characters are determined to make good and don’t care how they do it. I enjoyed the distinctive flavour of The Methods of Sergeant Cluff and the evocation of a time and place a world away from the swinging sixties: it was well worth bringing back into print.